We got back from our week long trip on August 25 and this last week, I've been adding watercolor, markers, stamps and embellishments using my August Take 10 Kit by The Studio 29 Designs, LLC. I finally broke out the Michael's watercolor set that I bought. 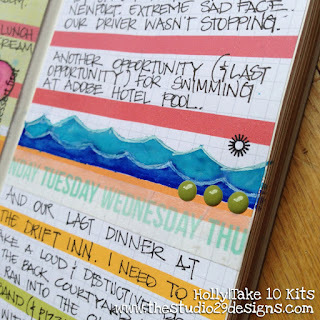 I used a mix of markers and watercolor and my white Signo pen to create the waves. That little tiny sun is from the weather planner stamp set! 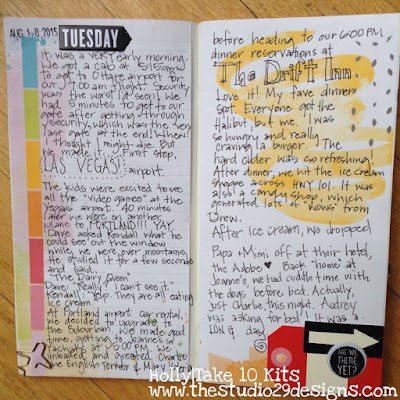 I used my stash of past Take 10 Kit stamps throughout this journal. 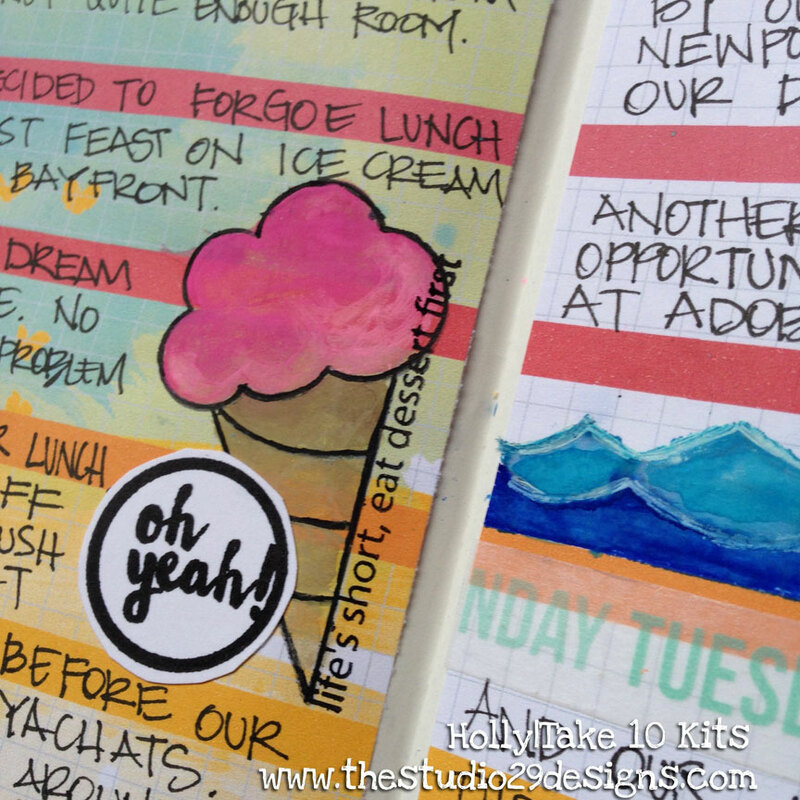 That ice cream cone was from the June Take 10 Kit (and still in the Studio 29 Designs shop here). I brushed on several layers of watercolor to make it opaque. "Life's short, so eat dessert first" is from the Foodie stamp set. It was so perfect in this journal spot about eating ice cream for lunch one day on the bay front. 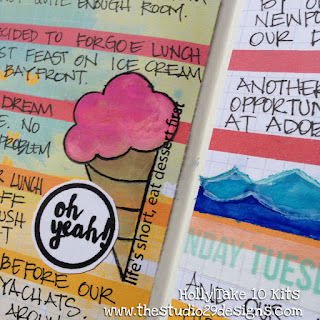 And I stamped "oh yeah" from the current August kit (Wonder Stamp Set) on white cardstock to layer above my ice cream cone. 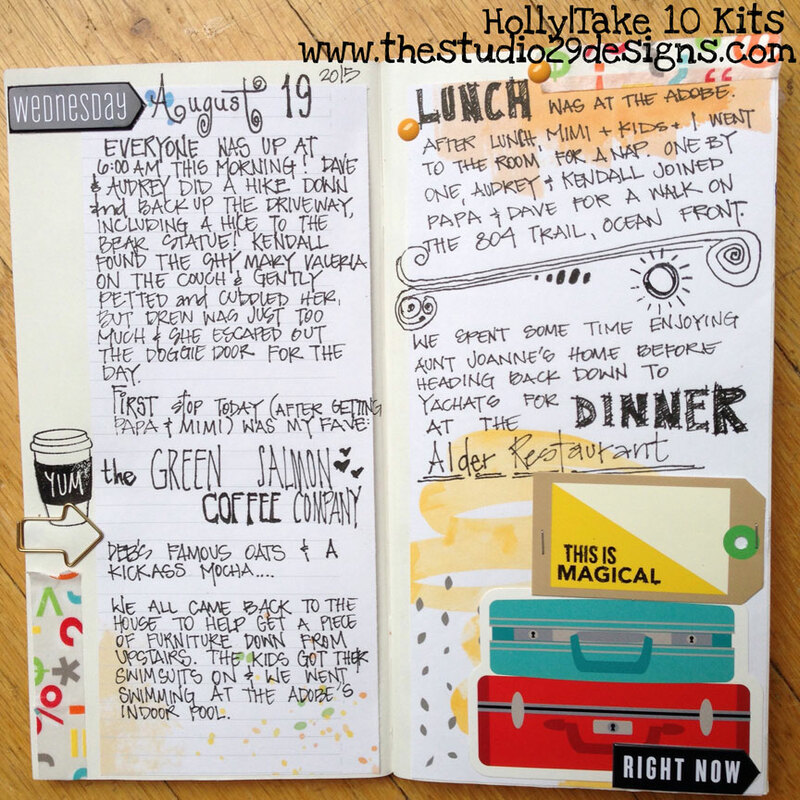 This month's kit had a travel theme to it, which was perfect timing for me. When I saw the globes, planes and such, I knew I would be using them in this travel journal. You can't tell by what I've shared that there is any room for photos, but there is! 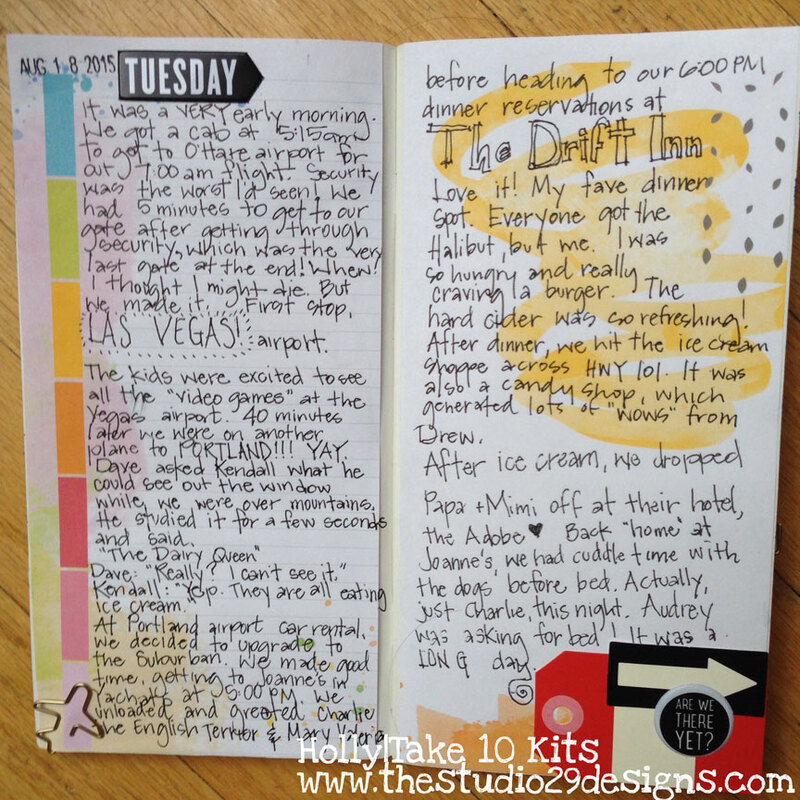 I plan on doing some pocket pages in a mini-album or maybe in my regular Project Life 2015 album; but I also want to add a few picture highlights to this travel journal also. That's the next phase! This project is so much fun for me. 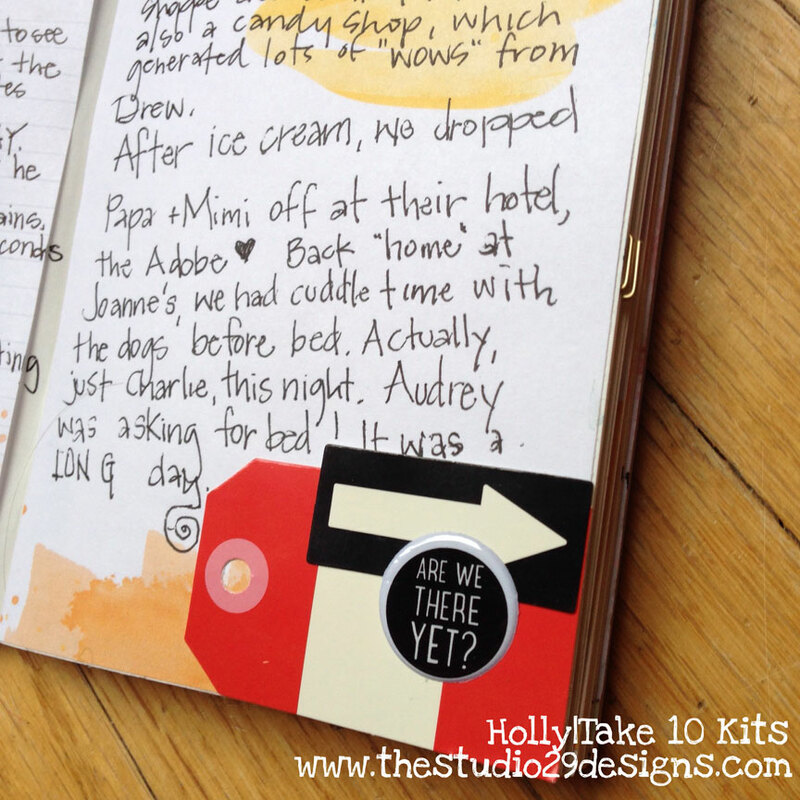 I encourage you to do this on your next trip! I'll be sharing more details on how I set mine up to make it easy to complete.